The questioner continued: should I be concerned? Do I need to add back in some fiber, maybe some kind of bran? Fiber, particularly supplemental fiber, has an UN-deserved reputation for curing constipation. In fact, in a recent study, it was found that those people who reduced or eliminated their fiber supplementation had less bloating and gas as well as more regular bowel movements. I am so glad you asked! Constipation is one of the complaints I hear from folks who have abandoned a long history of abundant grain consumption. It’s no fun for anyone to be constipated, and it can thwart the many health benefits you should expect to be getting from a low carb diet: just the ones you’re looking for in fact. A well-formulated low-carb eating plan should help you lose stubborn body fat, especially abdominal fat, and improve your cholesterol profile in a more healthy direction. So yes, you should be concerned let’s fix it. And no, let’s not use grains as a means to do that! Any of these steps that you are already doing, just check them off and continue to the next! First, make sure your whole body is working properly: be checked for sluggish function of the thyroid gland or congestion in your liver. When the long digestive tube is not working efficiently for any reason, start at the head and work toward the tail to get things working correctly for you. Remember what you may have heard about relaxing at mealtime! Relax when you eat; eat with friends if you can! Tap into your “Rest & Digest” parasympathetic nervous system, avoiding your “Fright, Fight & Flight” sympathetic nervous system. 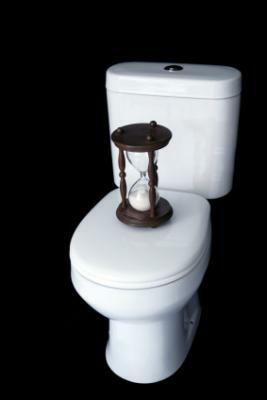 Rest at other times, too: it lets your digestive system work as it wants to. Drink adequate liquid: 1 ounce for every 2 pounds of body weight is maximal, 6 glasses is minimal. Coffee and tea can count if you’re used to them. Anything that suddenly makes you pee a lot more (increased coffee, tea, or beer – hey, beer isn’t on a low-carb diet!) doesn’t count. Salt your food! When you hear someone say, "Limit salt," just translate those words into "Avoid processed foods." Without processed foods, you can salt to taste and consume a health amount of salt. Low carb lowers body salt levels and can cause constipation. Especially on a low carb diet, it's important to salt your food to taste...and perhaps a bit more. Get some exercise every day: walking for a total of an hour, or something else that moves your entire body. Chew your food well and take minimal liquids with meals, to avoid over-dilution of your digestive juices. Exercise! Perhaps a gentle walk within the first hour of eating, and more vigorous exercise at other times of the day. Now let's talk about what you’re eating. Eliminate any food you know you are sensitive to, even if it seems to be a skin reaction. Eliminate dairy: its only reaction may be constipation! Butter is usually ok.
Eat fermented foods, such as sauerkraut (the jar from the fridge, not the center shelves in the grocery store.) Beet Kvass can be particularly helpful in normalizing the pace with which food digests through your intestines. Help your stomach: Betaine HCl can augment weak stomach acid secretion. Take 1 with each meal, and every day or two increase: 2 per meal, 3 per meal and so on. When you feel a little stomach warmth taking the Betaine, decrease the number back a step. Thorne Research makes a good Betaine product. Help your small intestines by taking some digestive enzymes. Innate Response Formula Digestive Enzymes, taking 1-2 with each meal. Re-populate your colon with healthy probiotics, taking probiotics between meals. Support your probiotics with fiber-based PREbiotics. The deal with fiber is that it’s best to get the fiber from food, particularly non-grain food (which can ferment and feed yeast and be overly irritating to the lining of your intestines.) Sweet potatoes, the chewy end of asparagus stalks, artichokes, Jerusalem artichokes!, leafy greens, and most vegetables all provide dietary fiber. An inexpensive and useful pre-biotic supplement is Bob’s Red Mill (or anyone else’s) Potato Starch. Taking 1-4 Tbsp in the evening can properly feed your colon bacteria, and as a bonus: lower your fasting blood sugar if that is a problem for you. If you tend to bloating, spasm, or other discomforts, start with a small amount and gradually increase to tolerance. Almost everyone is deficient in magnesium (you just can’t eat enough chocolate, I guess.) Magnesium oxide and even citrate can predictably move the bowels (great in the short term), but can deplete magnesium stores in the long term. If you take these forms of magnesium, you’ll also want to use magnesium topically or take magnesium taurate or another good storage form of magnesium. Vitamin C is another possible deficiency: take a good food-based form of vitamin C, it doesn’t take much to move your bowels. Now, if you get all the way through that list and are still having problems, please let me know!